There are a wide variety of cameras available on the market, with different target audiences, price ranges, and capabilities. Different consumers have different priorities, which shape the trade-off with respect to size, weight, photo quality, battery life, features, flexibility, ease of use, etc. It is hardly fair to rate a pro SLR or medium format camera poorly because it is heavy or large, nor is it fair to rate a ultra-slim point-and-shoot poorly because it doesn't have interchangable lenses. So when making our assessment, we have to ask ourselves, what is the intended market for this device, and will the trade-offs made be attractive for that segment. Size: This camera is not the absolute most compact model available. It isn't quite comparable to a Pentax Optio S series or Casio Exlim in terms of size or slimness. It's also still relatively small, and fits in a shirt pocket with no problems. This size range means that the camera is not going to have a huge sensor or lense, and won't have interchangable lenses either. Cameras of this size also usually don't support CF cards. In fact, this camera doesn't even support full size SD cards. Small body size also limits the size of the battery, and thus the possible use time. Likewise, limited space for controls means that not everything will be available for manual control, even is the user wanted it. What makes this camera high-end for a compact model? The sensor is very good in low light compared with other similar sized models. The resolution is relatively high. The lense is decent (given the camera size). The photo processing engine is relatively impressive for a compact model. Continuous shot mode and HDR are supported. More of what makes this camera high-end will be discussed below. 2. "Digital Lifestyle" people (or early adopters), and those with only smart phones. These people will be attracted by its touch screen, convenience and connectivity features. WiFi can be used to transfer photos to Android and iOS devices, which means that people without a computer will have no problem retrieving and uploading their photos - though the photo quality is better than even the best smart phone cameras available right now. WiFi can be used to transfer to computers as well, though the USB cable or TransferJet are by far faster methods. The GPS usually gets a signal very quickly, adding another dimension to photos. 3. Those who want easy and convenient no-fuss operation. Of course the points above overlap to a certain extent, both with the people involved, and in terms of the features. Technical people will like the convenience features for the sake of technology perhaps, however people who want simple operation will appreciate the same features. Also, there are probably many people who want advance features, but also want simple operation. At any rate, the main differentiation factors for this model are not the photo quality, but the digital connectivity features. There are cameras with larger sensors, bigger lenses, higher optical zoom, and more megapixels - possibly in the same form factor - but there are few with conctactless charging and sync, WiFi Direct, and GPS in a waterprood casing. The body is made of Dark Grey plastic and tempered glass. Some people will think it feels cheap, and well, like plastic. It certainly doesn't feel hollow or anything, and seems quite sturdy. On the other hand, it's not the sort of item you should drop, regardless of construction materials. It's worth noting that Sony's digital cameras all have plastic casing inside, regardless of whether metal is used on the outside or not. 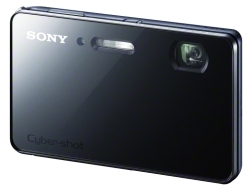 Because of this, Sony's plastic cameras can be smaller than models with a metal body. It should be noted that the smooth glossy body attracts fingerprints on the front and back. You should make very sure that the battery latch is tightly closed if you plan on using the water-proof features. Inside the typical cardboard box you will find a black shiny plastic box containing the camera and accessories, which is a nice touch. The amount of paper documentation is very minimal (one folded sheet inside the plastic box, a little more on the outside), however there are guide functions inside the camera itself. (Also, a users' guide is available online). A very typical small black hand-strap is included. A short black stylus (which can slip to the hand-strap) is also included for those who want to avoid dirtying up the screen with their fingerprints. The required Sony Type N battery is included. (You may want to purchase a spare for extended shooting). "MultiStation" Docking station (Black) - This connects to the computer or AC adapter, and then can be used to charge the camera and even access data. AC Adapter (Black) with folding prongs - This is much like the ones that come with many recent mobile phones, one side has AC prongs, while the other has a USB port. The prongs fold in for compact storage. Standard USB to Micro-USB cable (black) - One end of this is connected to the AC Adapter or a computer, while the other end is connected to the docking station, or the camera itself. Case (Unless you count the plastic box as a case). Optical Zoom - The zoom works and looks sharp, even though the lens doesn't protrude from the camera body. Even without sticking out, the optical zoom is 5x, which isn't bad. Some Sony cameras with similar specs (minus the WiFi and Waterproofing) have 10x, though. If a big zoom lens is your priority, you might want to consider other models. Digital zoom is really the same thing as cropping, except that you can preview it on the viewfinder while taking the shot. (Which is to say, it's a relatively useless feature when compared to "real" optical zoom). Megapixels aren't everything - but the quality of the photos is high, even when heavily zoomed and cropped. A larger sensor, and/or lens would almost certainly lead to better image quality than increasing the pixel density would at this point. Scenes - There are Scene modes for: food, beach, fireworks, under water, portrait, pet, night, and more. HDR is also included under the scene menu. For example, the fireworks scene locks the focus at infinite. In the portrait mode, the camera can be set to snap the shutter automatically when people smile. Effects - There are many fun effects: Part-Color (where the images is taken in black in white, except for objects of the selected color), Pop Color, Mini, Toy Camera, High Key, Water Paint, Illustrator, and more. There is also a "Program" mode, and two "omakase" (Let the camera handle it) modes. The "Premium Omakase" mode results in better photos, but takes some processing time, whereas the normal omakase mode is instant. Most of these effects could be done on the computer with software like iPhoto or Photoshop, but having them on the camera enables real-time preview, and processing is very very fast. Continuous Shooting - There are two modes, H (Rapid) and L (Slow). In either mode, holding down the shutter will cause multiple shots to be quickly taken. This can be used for things like sports and fireworks, though it should be noted that it doesn't work in all scene/effect modes..
Focus - The camera has a decent focus system with multiple focus zones, but of course it isn't perfect. Manual Control - This isn't a manual camera, but a number of settings can be controlled manually if desired, including the brightness (exposure), color balance, white balance, Saturation, and more. Movie - The highest quality movie modes are too high for DVD players to handle, so if you are planning to burn onto a DVD for playback in a standard DVD player, the videos will have to be converted to lower the resolution first. In fact, our test laptop (Core 2 Duo) was unable to play back AVC movies in the highest quality mode smoothly. The downside of having more features is that it makes things more complicated. Most of the connectivity features on this camera are simple enough, but there are quite a number of ways to get photos on and off. We will go from normal to special. Using the memory card. Many people prefer this method, remove the card, put it in a card reader, and read the data on the computer. This requires that you have a card-reader, and that it read the kind of card you are using. It also requires opening up the camera every time. It also won't let you read the camera's internal memory. Using USB Cable to the camera from a computer. This is easy, and shows the files on the computer the same as using the card would. Using the dock + TransferJet. The dock must be connected to the computer, and then it works basically the same as either of the two methods above. (i.e. no special setup, software, or drivers are required to use TransferJet). Although contact-less, this method seems to be approximately as fast as the first two when transferring a reasonable number of photos. The only down-side to TransferJet seems to be that the filesystems appear the computer as read-only, so you can't have the computer delete files from the card. (You can easily do that by the camera once you're done, however). The reason for the read-only limitation is almost certainly to prevent filesystem corruption on the memory card from sudden disconnection, which is certainly more likely when the user can simply pick up the camera at any time. Incidentally, Sony also sells some flash memory with TransferJet technology embedded. The included dock can probably be used to read these cards as well. WiFi to a SmartPhone - This method turns on WiFi Direct, where the camera acts as a WiFi Access Point (with no Internet Access) . Then you can connect your Smart Phone to the Camera, launch a special Sony App called "PlayMemories", and download the photos. Note that they will be reduced in size to 2MB when using this method. The process is a bit more streamlined on Android than in iOS, where you have to manually connect to the Camera's network in the WiFi settings. Send via WiFi to a computer - This requires special proprietary Sony software in order to work, so it is not readily available in Linux. In Windows, there is a lite version of PlayMemories for Windows that does the job. In MacOS, there is a special WiFi Transfer program that can be downloaded from Sony's site. Either way, you have to install the software on your machine, and then connect the camera via USB to set it up. If you don't do this, then when selecting the "WiFi to PC" option on the camera, a message is displayed along the lines of "Please connect the camera via USB first to set up the PC WiFi connection". In practice, the speed when sending via WiFi is a bit slower than TransferJet or USB, so you will probably mainly only use it when you don't have a cable handy. Also, when using the "Send to PC via WiFi" option under MacOS, the transfer will start, and files will be downloaded automatically to the folder selected when setting up the transfer utility. The user has to import them into their Photo Management software later, if desired. WiFi Media streaming - It is possible to display media on DNLA enabled devices (TVs, etc.) if connected to the same network, or the devices support WiFi Direct. Impression: Although it's a shame that WiFi seems not to be usable to the computer without installing special software (and using Windows), it really isn't a practical issue, since TransferJet works so well. Also, many cameras will connect via USB for data transfer, but won't charge the battery. The TX300V doesn't require a separate charger, so you can download the photos to your PC while it charges the camera at the same time. * Flash, Red-Eye reduction, etc.